Crostini is the Italian word for a piece of toasted bread, and the word crostini instantly evokes a sense of contentment. Olive oil seeping into each slice, juicy tomatoes, creamy cheese, garlicky beans. It's the kind of thing I can make an entire meal out of in the summer. Sometime during college I started ordering bruschetta at every restaurant that had it on the menu. It began seriously our sophomore year, when Andrew was taking a year of Italian and we visited a local restaurant recommended by his professor as being the most authentic in the area. We ordered bruschetta to start, naturally. It's so simple, really. Juicy tomatoes, basil ribbons, olive oil, not to mention the crunchy bread, but it's one of the most satisfying things to eat. I love that about food, and Italian food especially. The recipe used two pans, one to cook the radishes, and the other for the sauce. I saw no sense in having another pot to wash, so I modified the the cooking method, and eliminated the anchovies since I didn't have any in the fridge. 1. Remove leaves and stems from radishes; trim the tails. Cut larger radishes lengthwise into about six slices and smaller radishes into quarters. 2. Place a large skillet over medium-high heat. Add 1 tablespoon oil, radishes in a single layer, and salt and pepper. Cook radishes, without moving them, until they are lightly colored on undersides, about 3 minutes. Shake the pan and continue cooking until they are tender, about 3 more minutes. Remove radishes from the skillet. 3. In the same pan, melt butter. Stir in garlic, red pepper, and a few more tablespoons of oil. Reduce heat and simmer about 4 minutes. Add the radishes back, along with the parsley and toss to combine. 4. 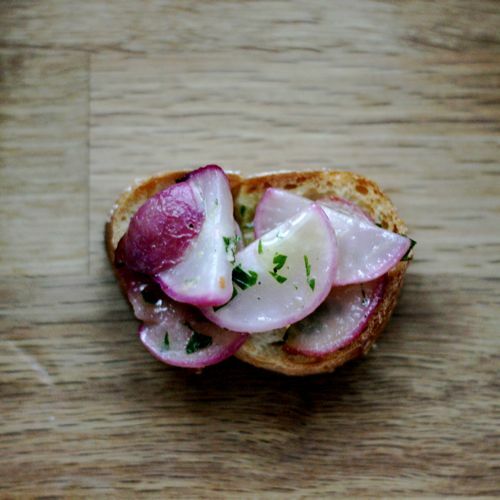 Top each slice of toast with radish wedges and spoon additional sauce over the top.